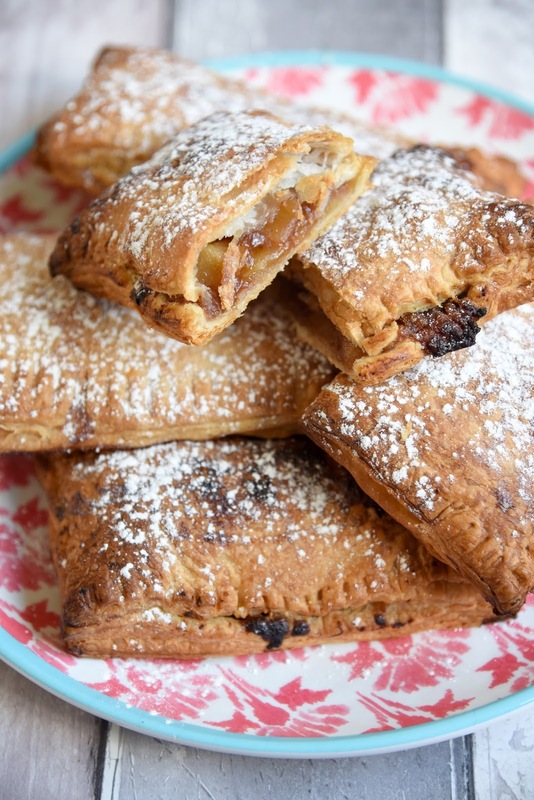 Here in the UK we're really not short of different types of savoury pasties, over in the US they call pasties hand pies (so cute), but also they make a lot of sweet hand pies, why isn't this a thing here?! Obviously we have lots of regular sweet pies, but little individual ones is such a cute idea! For my first foray into hand pies, I decided to go with a classic, apple! This filling is so delicious, sweet and sticky with loads of cinnamon and goes so well with the crispy puff pastry. 1. First make the filling, in a saucepan, melt the butter and allow to brown to a golden colour. Add the apples, salt and both sugars and stir. Cook, stirring occasionally until the apples are softened, about 8 minutes. Add the cinnamon and maple syrup and cook until soft and sticky, about 2 minutes. Stir in the cornstarch and allow mixture to thicken. Remove from the heat and set aside. 2. Preheat the oven to 210 degrees C. Line a large baking tray with parchment paper. Lay out your dough and cut into 10 rectangles. Divide the filling between 5 of the rectangles, and brush some milk along the edges of the pastry. Lay the remaining unfilled rectangles on top of the others. Using a fork, crimp the edges of the pastry. 3. Transfer pies to prepared tray, brush tops with milk and sprinkle with sugar. Bake in the oven for 18-20 minutes, until puffed up and golden brown. Transfer to a wire rack. Dust with icing sugar if desired, great eaten warm with ice cream.